As someone who loves clothes but now feels deserted by fashion, I hardly needed an excuse to splash out on new gear when I took up cycling, but as a tightwad, I’m also keen to raid my existing wardrobe for the bike. Because I live a country life with some outdoor aspects (dog walking, rambling, gardening etc), I already own a lot of ‘outdoor’ clothing, but much of it isn’t right for cycling, because what I go for in general is maximum coverage, especially in coat lengths, and that’s not suitable for riding. Also, most of my trousers have proved too flappy and annoying on the bike, even with clips. and for on-road use, it should be a bright colour. However, even with all these seemingly stringent criteria, I found I still had quite a few bits that will do for the bike, and most of them were items I wasn’t wearing. One such is my Marinac jacket from Lands’ End. This softshell fleece has raglan sleeves, a dropped back with drawcord, windproof zip with zip garage, velcro cuff closures and zip pockets – all features that make it ideal for my style of cycling. But I’ve never worn it much, except for driving to the swimming pool – in practice, this Alpine style of short jacket has been too cold for walking and I also made a mistake with the colour. I bought a pale lilac, not the green shown, and it is a: too bright for the countryside and b: shows every mark. But these issues are fine on the bike, where I’m actively seeking to be visible. 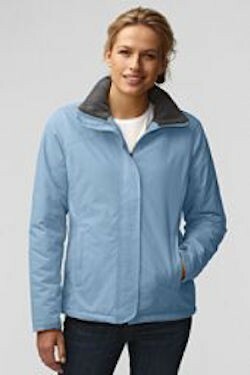 Another Lands’ End item that is going to get a tryout is the Squall Jacket, which I brought in pale blue and then never wore because, again, it was too bright and too short. 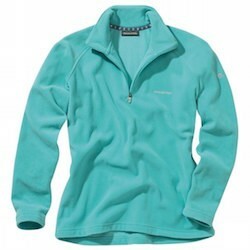 It has useful features such as a dropped back, warm fleece lining, fleece-lined zip pockets, a storm flap on the front zip, velcro wrist closures, an easy-access inside pocket with velcro closure, and a fleece-lined hood big enough to go over the cycling helmet and be tightened with drawcords. My Woolpower 200 turtleneck top (seen at top) also looks ideal for cycling on a dry day because of the long dropped back and zip front, and its red colour almost matches my Sheila Moon gear. In fact, in cut, what could look more like a traditional cycling jersey? I’m a little concerned, though, that it will prove too open a weave. 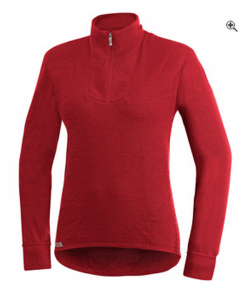 Also up for a try are a couple of Craghopper zip-neck fleeces, which I never wear because of their bright colours and tight arm fit, but can’t bear to get rid of because they are such nice quality. With their tight-fitting sleeves, close cuffs and zip necks, they should be handy on the bike, teamed with a high-vis gilet. In winter, at home, I mainly wear stretch fleece polonecks from Lands’ End, which are snug, warm and comfortable, and which I envisage might do double-duty on the bike, under a gilet. And I have a few fleece gilets that might work, especially my sherpa-fleece-lined gilet with softshell finish (I picked it up in a clothes swap, so have no idea what it’s called but it has the same finish as the Marinac). I also find I have four parkas that might do at least some duty on the bike: the Sunshower in autumn yellow; the Squall in daffodil yellow; and the Thermacheck 200 fleece parka in turquoise (all from Lands’ End), plus the lightweight Windshadow Mac from Rohan. I bought the first three for dog-walking, so visibility was one criterion, but all four also all have useful hoods, and in some cases zip or velcro pocket and wrist closures. The weather hasn’t been cold enough to try these out yet, and they don’t have every feature I would ideally like, but they might well do for shorter rides, or where I have panniers to put things in. In another post, I’ll look at hacking a cycle jersey out of old sweaters.